Part II of our Rosetta Stone essay is a collection of miscellaneous topics some of which may or may not provide information useful for a fresh decoding of the VMS. It's a shield in the form of a heraldic flower known as the fleur de lys. 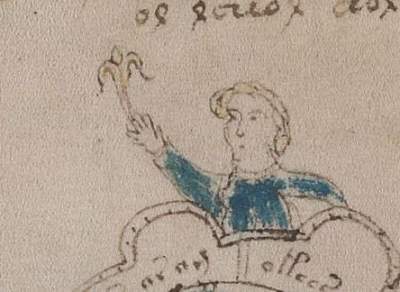 That's an unambiguous fleur de lys in his hand, resulting that Herball points back to the VMS. To continue, notice that in concept similar to how the Roman XL is 40, the 4L can be construed as 46. The L is followed by an OR below. We see what looks like a comma after the R but there is reason to believe that it is really an apostrophe the rises up to place itself to the right of the top of the L, giving us L'OR. And here we spot the "fleur de lys" at the end of the third line. Thus, the numbers on the poet's shield point us to two fleur-de-lys, one in the VMS and the other in the Nostradamus prophecies, and in this manner the two books are linked together as source and output. Herball, almost certainly inspired by the VMS plants, remains to this day one of the largest botany books ever published in the English language. Some might suspect that the scientists who wrote it probably had never heard of Nostradamus. To dispel any such doubts, we need only note that at the end of the final paragraph of a Herball dedicatory of one botanist to another, we inexplicably find the words: "Nostradami, Salonmensis Gallo prouincie." Nostradamus lived in the town of Salon in the French (Gallo) province of Provence. 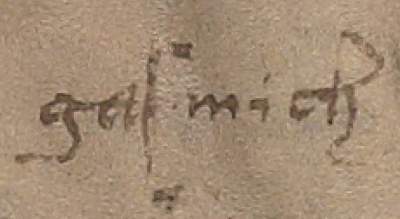 Returning briefly to the marginalia on f116v, we see that the first word here looks like a truncation of the Latin gallo, or even the Spanish galo, both referring to a native of Gaul, from where we understand Mich(el Nostradamus), Frenchman. As we saw, a VMS prophecy could have inspired the English navy to be aggressive against the Spanish fleet and even have helped them to develop a specific strategy. It would therefore seem that Charles Howard (Lord Admirable of the English navy from 1585 to 1619) owed his poet laureate (presumed contributing decoder of the VMS prophecies and author of the marginalia) a big favor for providing him with crucial information on how to defeat the Spanish Armada. Where and how Howard initiated contact with the unidentified poet laureate is unknown, but he certainly should have had contact with diverse writers since, prior to being promoted to Lord Admirable, he was Lord Chamberlain of the Household with direct authority over players who performed before the Queen. The favor? Howard became a staunch defender of the London theater and is particularly noted for having successfully defeated efforts by the city of London to close down the theaters on morality grounds. He was also the patron of the Admiral's Men, one of the two leading groups of actors in London, and he married the daughter of Henry Carey who replaced him as Lord Chamberlain and became the founder and patron of the other leading group of actors, called the Lord Chamberlain's Men. Our poet laureate could have had ties to any of the above as well as to the Lord Burghley, opposite whom he is depicted on the cover of Herball. As evidenced by an extant letter of doubtful authenticity, dated 1666, someone called Godefridus Kinner, living in Prague, wrote to someone called Athanasius Kircher, living in Italy. In this letter, Kinner inquiries if he (Kircher) has made any progress in decoding the VMS, saying that he (Kinner) was anxious to find out what it says. In the next paragraph, Kinner highly recommends that he (Kircher) read a book called "Atlantidis." We find the word "Atlantidis" (precise spelling) in a publication dated 1648 with reference to a book called Novus Atlas published therein. It turns out that Novus Atlas is merely the Latin version of New Atlantis, a book published in English in 1627 and attributed to Sir Francis Bacon. A great mystery is why New Atlantis was suddenly called Novus Atlas, New Atlas? Thomas Tenison, Archbishop of Canterbury in the late 17th century, is quoted as saying: "This fable of the New Atlantis in the Latin edition of it, and in the Frankfort collection, goeth under the false and absurd title of Novus Atlas : as if his lordship had alluded to a person, or a mountain, and not to a great island, which according to Plato perished in the ocean." "Define quae vastis pomeria montibus Atlas"
Today, it is a large city in Morocco but centuries ago they must have been wondering: why in the world are the prophecies (VI-54) referring to a trading post of the African desert? "The demi-Atlas of this earth, the arm"
"That raught at mountains with outstretched arms,"
Thus, via the arm(s) at the end of each line, the Atlas of the first line picks up the mountains from second line. 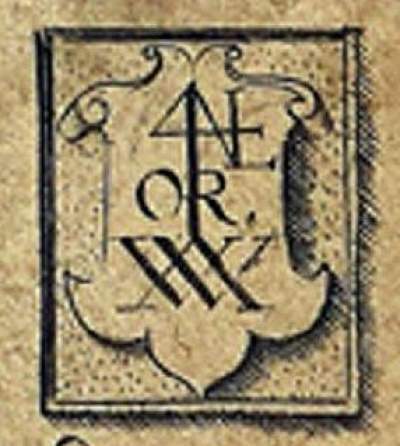 Of course, a direct referral to the Atlas Mountains could always be coincidental, but this demi rendering successfully stamps the respective book as a product of the Rose Cross. Similarly, Novus Atlas (by virtue of its ridiculous title) has to be a product of the Rose Cross. With no discredit to the greatness of Francis Bacon, it is surprising that his name appears on the cover of New Atlantis (published after Bacon's death) because at that time the real Rosicrucians never published anything in the true name of one of their members. Indeed, such a thing would run contrary to their oath of secrecy and pledge to renounce all recognition or reward for their undertakings, as mandated in their manifesto. "To conclude this point, the example of Saloman is before the rest and greater, whose wisdome and knowledge was such, that he was able to set out the nature of all plantes, from the highest Cedar to the lowest Mosse." "So as I take it to be denominate of the King of the Hebrews, which is famous with you, and no stranger to us; for we have some parts of his works which with you are lost; namely, that natural history which he wrote of all plants, from the cedar of Libanus to the moss that groweth out of the wall;"
Wikipedia fails to inform us that the biblical Solomon wrote a natural history of plants which has been lost, nor a lost book of prophecies for that matter. Regardless, for lack of a better name, from here on we will refer to the VMS prophecies as Solomon's Prophecies. "It was the erection and institution of an order, or society, which we call Saloman's House, the noblest foundation, as we think, that ever was upon the earth, and the lantern of this kingdom. It is dedicated to the study of the works and creatures of God. Some think it beareth the founder's name a little corrupted, as if it should be Solomon's House. But the records write it as it is spoken." But the records write it as it is spoken. Perhaps the underlying text of the VMS is not formal writing but rather a rendering of languages the way they are pronounced? For sure, this could explain abia in place of habia in the marginalia on f116v. Moreover, similar to how the Latin alphabet is used to represent many languages, the VMS glyphs could represent the sounds of many languages. Which languages? "In which scroll were written in ancient Hebrew, and in ancient Greek, and in good Latin of the school, and in Spanish these words: Land ye not ..."
"allda lehrnet er die Arabische Spraach besser, wie er dann gleich in folgendem Jahr das Buch vnd librum M. in gut Latein gebracht,"
This likely adds Arabic to the list of VMS languages. Thus, in quire 20, all the individual lines in between the stars colored red, all say the same thing, but each line in a different language, except possibly for the short lines whose function and meaning remain to be determined. 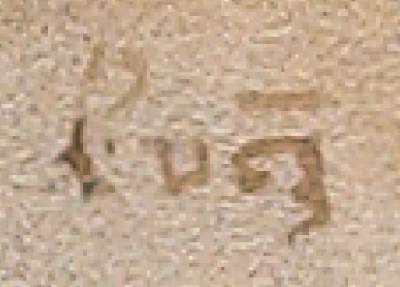 The marginalia has identified for us four lines where the underlying VMS language could be Spanish for one of the prophecies (see Part I). In the given scenario, it would make sense for decoders to try to work with at least two lines simultaneously, comparing and contrasting these languages against each other to get a better rendering of each. For example, if it is doubtful whether a word in the English line should be bear or bare, and if the corresponding Spanish line says oso, the decoders would immediately know that bear has to be correct. "There was also in both these writings, as well the Book, as the Letter, wrought a great miracle, conform to that of the Apostles, in the original Gift of Tongues. For there being at that time in this land Hebrews, Persians, and Indians, besides the natives, every one read upon the Book, and Letter, as if they had been written in his own language." The Book is understood to be the thirty-nine prophecies and the Letter ("epistula" in the Latin version) is understood to be the Incantation (see Part I). Meanwhile, the Persians, if not alluding to a prophecy where Persia is a theme, are suspected of being only a diversion to trick us into envisioning a transition from the Holy Land to the country of India (which makes no appearance in the prophecies), while the word "natives" points us to the true intention: these Indians are native Americans. In the VMS, these images surround the depiction of a field where two hundred heretics were burned alive in a giant bonfire. What do these images have in common, or, what could they have in common? Answer: They could all depict the earthly lodgings of the heretics prior to their martyrdom. In other words, the image on the right may be exactly what it looks like: a native American tepee. See our essay The Voynich Manuscript: A Made-in-the-Americas Theory (link below) for more information. Of course, the tepee of the Plains Indians was probably unknown in 16th century England which could explain why it escaped the massive purge (removal) of all pages depicting something or anything from the New World. Moreover, decoders should note that in 1585, barely a year after the alleged arrival of the VMS in England, a linguist by the name of Thomas Harriot (an alleged associate of the author of the VMS marginalia) was contracted to create a phonetic alphabet of native American languages. Analogously to how Christian missionaries might carry a Latin Bible into the jungles, quire 20 of the VMS is presumed to contain the core text of an Old World religion. Decoders, therefore, would be well-advised to concentrate their efforts on that section: it might be the only part of the VMS encoding a language known to us. The first word, meillior, looks like a mixture of the French meilleur and the Latin melior. Both words mean better. For whatever reason, the author seems to be breaking away from Spanish here. The second word, allar, does indeed look like Spanish where the double ell has a pronunciation closer to the French meilleur than it would, for example, to the English follow. Recall that that the VMS writes words by how they are pronounced, not by how they might be spelled in a formal dictionary of the respective language. Recall also that in the marginalia of f116v, the Spanish habia was redacted as abia. Here too the allar needs to be preceded by a silent h, giving us hallar, a very common Spanish verb meaning to find. The first letter here looks like a P, but with a dot to the right of it (at the height of the top of the u), and with a backslash pointing down, it might be meant as the letter p or, alternatively, a variant form of writing one of the tower glyphs (EVA "k"). Earlier, the opposite procedure got us umer untPferd. Unambiguously, a u follows. Recall that on f116v we had to transform liber into libre, and ubre into urbe, in each case moving one letter one space to the left. Thus, we must consider both possibilities: pu(?)(?) and up(?)(?). Under the mysterious bar, the first glyph is the 16th glyph in the series of 17 glyphs repeated four times around the alphabet wheel on f57v. It's the one in the middle. Note that in the first of the four series of 17, the 16th glyph begins with a backslash rather than a c, so this glyph might represent two different sounds or two different Latin letters. Similarly, we see slight discrepancies in other glyphs so perhaps twenty or more different sounds or letters are represented in those series of 17. The second glyph under the bar resembles the 8th glyph in the series of 17 glyphs repeated around the alphabet wheel. Again, it's the one in the middle. The first letter of the second word following our mystery word (the one in the same tone of ink) looks like utter confusion between the letters u and v, so we should probably add pv(?)(?) and vp(?)(?) to the potential targets. 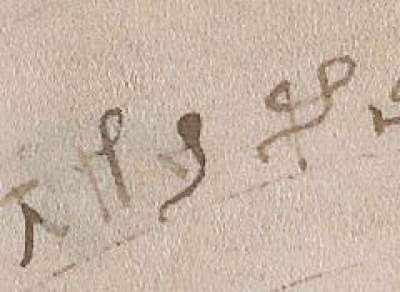 In the fourth line of f116v, the Germanic misdirection valsch, likely meaning false or falsely, begins with a v that could almost be mistaken for a u, and it precedes ubren, so possibly we can here infer confirmation of confusion between the letters u and v.
In view of the break from Spanish at the beginning of the marginalia on f17r, our target word could probably come from any language, even from English for that matter granted that the VMS has strong ties to England. Indeed, the faint word following the target word begins with an h (surely a hint to insert an h before allar) and could be construed as the word how, implying that our mystery word might very well be an English word. But one thing is for sure: there is no such word, in any of the given possibilities, in the VMS. Where are we supposed to find it? 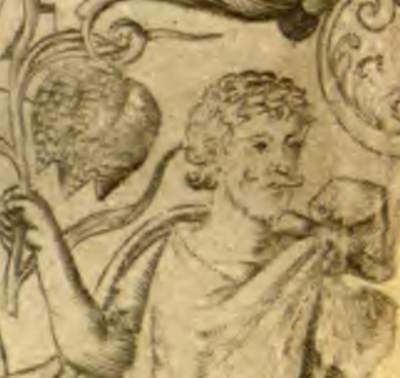 The other three personages depicted on the front cover (the botanist John Gerard, the botanist Matthias de l'Obel, and His Lordship William Cecil) are all easily identifiable from extant portraits. Moreover, the Dedications on the opening pages of Herball refer to all three of them. But for our poet laureate, there is nothing. At least one renowned literary scholar has studied this Herball depiction and, though it was acknowledged that the Herball portrays a poet laureate, apparently this depiction cannot be associated with any poet known to humankind. Which in round drops, vpō their whitenesse stood. That checkered flower (with the correct colors named) can be found in the fourth line. But wait a minute. What's that "vpō" in the last line? The ō isn't an English letter and it appears nowhere else in that book. And there's a mysterious bar over the top of it, just like the two glyphs from f17r. Beware that the v of vpō is really a u, which could lead one to surmise that the English cherished silliness so much that they would sometimes write a u like a v. Luckily, that madness came to pass just a few decades later but for the moment we are stuck with it. Searching through the entire text for words of four letters matching any of the four spelling possibilities, we found twenty instances of the word vpon and nothing else. The only instance of vpō was the one in our citation. So that has to be the answer: vpō stands for vpon or, in modern English, the word upon. Thus, the 16th glyph of the series of 17 could represent the Latin letter o and 8th glyph of the series of 17 could represent the Latin letter n. Alternatively, one glyph might stand for the letter p and the other for the letter ō (representing on). It is not much to go on for decoding the VMS, but at least it is a start. Based on the latest research, however, the wheel of 72 Latin letters (see Part I) could be an entirely better approach for decoding the VMS. 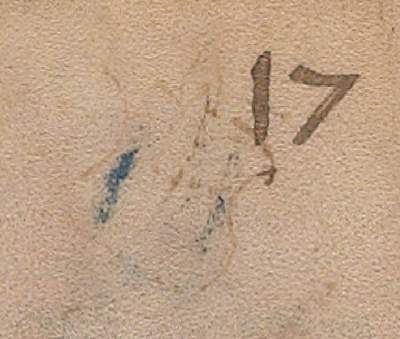 In those circumstances, the purpose of the marginalia at the top of f17r is merely to identify its author whose other writings provide a clandestine guide for extracting the VMS prophecies from the Nostradamus prophecies. "Wither did the Poets hunt for their syncere delights, but into the gardens of Alcinous, of Adonis, and the orchards of Hesperides?" One can only wonder: Could one of those words in italics be alluding to the title of the poem where the willing Reader should hunt for the mystery word? But this much remains certain: a brilliant poet laureate wrote the marginalia to provide hints on how to break the VMS code. Our Rosetta Stone does not imply that a fresh decoding of Solomon's prophecies (in quire 20 of the VMS) will be forthcoming anytime soon: we were provided with only vague indications of the complex processes whereby the VMS glyphs transcribe into words written in the Latin alphabet. To all appearances, the VMS code was designed to be broken only by someone with specialized knowledge, for example, by someone who knew how to maneuver strings of text (either glyphs or letters), oscillating them forwards and backwards, around the wheels of the Merkabah (f57v). Presumably, when the correct alignments are reached, consonants get paired with vowels (vocalizations) on the opposite side of the wheels to form gates representing the sounds of Middle Eastern or European languages. Alternatively, the glyphs are directly converted into Latin letters from a wheel comprised of the 72 letters (again, see Part I of this essay). Also useful could be knowledge of rotating polygons to rearrange the order of glyphs or letters placed around a circle, general knowledge of right to left transliterations, and knowledge of gematria whereby glyphs represent both letters and numbers and combinations of letters get transformed into other letters via numerical equivalencies. "The first of this Fraternity which died, and that in England, was I.O., as Brother C. long before had foretold him; he was very expert, and well learned in Cabala, as his Book H [presumably the Sefer Yetzirah written in Hebrew] witnesseth." "the same author amongst you (as it seemeth) had some relation from the Egyptian priest [translation of sacerdote Aegyptio] whom he cited." "Jerusalem was not so much now in his mind as Damcar [cryptic allusion to the city of Safed]; also he could not bridle his desires any longer, but made a bargain with the Arabians that they should carry him for a certain sum of money to Damcar … There the Wise Men received him not as a stranger (as he himself witnesseth), but as one whom they had long expected;"
"they call him also the Milken Way [aka Leo], and the Eliah of the Messiah; and many other high names; which though they be inferior to his divine majesty, yet they are far from the language of other Jews." These words accurately describe the greatest cabalist of all time but he allegedly died in 1572, some dozen or more years prior to the decoding of the VMS. On the other hand, the falsification of one's death and/or burial place appears to have been a Rosicrucian norm.